Paul Ordonez and his friend Nate changed their fishing location at the last minute and ended up fishing the planck at LaPerouse. Good thing, too, because Paul's hang-bait rig baited with a small puhi (eel) paid off with a powerful strike at 1:58 a.m. The fish went on a rampage but Paul managed to defeat the beast and get it into Nate's gaffing range. 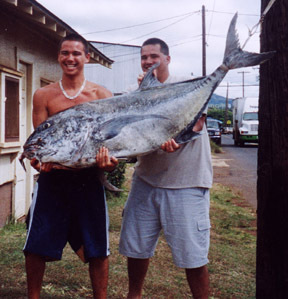 Game over, except for the weigh-in at Maui Sporting Goods and the good news--112.4 lbs!